ASRock has shown off their latest Z170 motherboards at a pre-computex show which include their top-tier Z170 Extreme 7 and Z170 FATAL1TY Gaming K6. The new Z170 chipset based motherboards were shown off with finalized details which goes off to show that motherboard manufacturers are ready for the launch of Intel’s next generation Skylake processors which launch in Q3 2015. 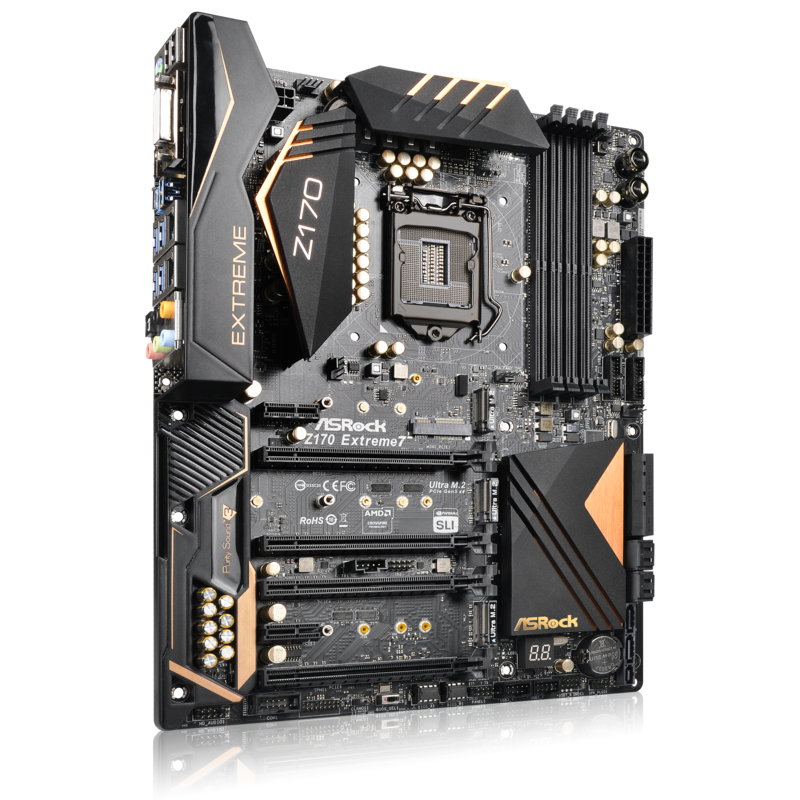 First of the Z170 lineup from ASRock is the high-end Z170 Extreme 7 that comes with a fully loaded super alloy design.The motherboard adopts a black and gold color scheme like the previous Extreme boards and offers a lot in the overclocking department. 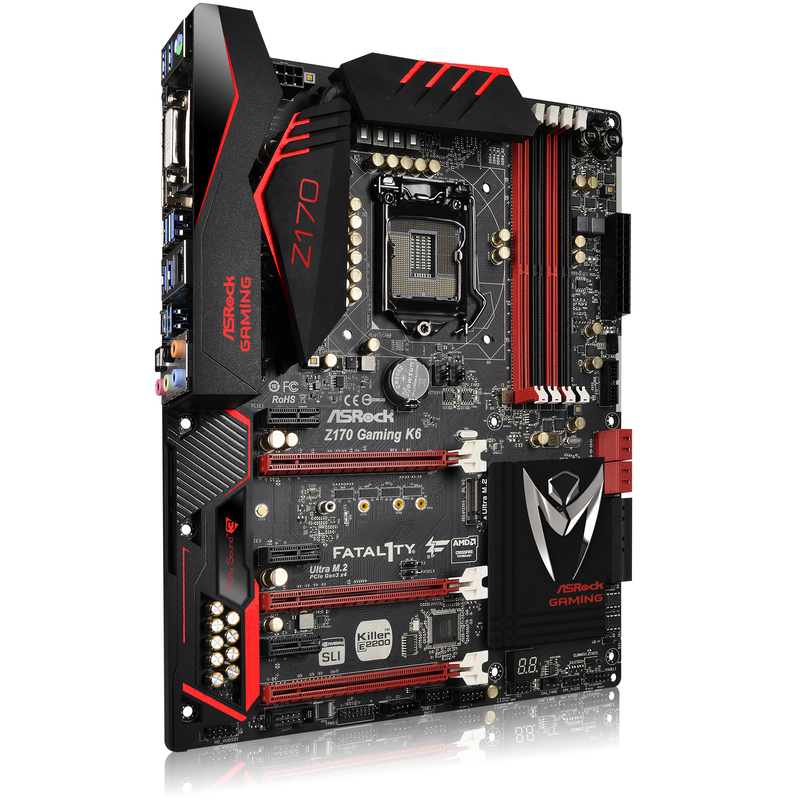 Fitted with high-quality capacitors, VRMs and MOSFETs, this motherboard is meant to push the overclocking limits. The LGA 1151 socket that allows support of Intel’s Skylake processors is powered by a 8-Pin connector while the board draws power from an ATX connector. The motherboard has its VRMs and power area kept cool by a large aluminum heatpipe based heatsink that has a Z170 label etched to it. Being the first mainstream consumer platform to support DDR4 memory, we found four DDR4 DIMM slots on the left side to the socket. There are separate power phases for the DIMMs to enhance overclocking on the modules. Two switches (On/Off and Reset) can be found along with a CMOS reset switch. Storage will include 8 SATA 6 GB/s and 2 SATA Express ports while there is a single USB 3.0 and two USB 2.0 internal headers on the motherboard. The Z170 chipset is kept hidden inside a cool aluminum based heatsink with a nice design. The motherboard includes a Dual BIOS that can be changed from a switch and a Diagnostic LED can also be spotted. When it comes to expansion, ASRock is offering three PCI-e 3.0 x16, three PCI-e 3.0 x1 slots and a single Ultra M.2 slot that operate at speeds of PCI-e 3.0 x4. On I/O front, we can see 8 USB 3.0 ports, two USB 2.0 ports, Killer E2200 LAN port, a 7.1 Channel audio jack, PS/2 port, HDMI and DVI display outputs. Sound is provided through the Purity Sound 3 design that has the technology implemented on an isolated PCB. ASRock is using a thermal armor across the I/O and sound PCB to enhance thermal loads and looks of the board. Expect more details on Computex 2015.